Although many armadillos reside in the Texas Hill Country, this is the story of a very special one named Bluebonnet. Dubbed “everyone’s favorite armadillo” by “Texas Highways” magazine, Bluebonnet is nurtured by her armadillo family until it’s time to leave the burrow. When she discovers a camp by the Guadalupe River, she longs to be a camper. That’s when the fun and unexpected adventures begin! Mary Brooke Casad is the author of the popular “Bluebonnet Armadillo Adventure Series,” detailing the travels of Texas’ most loved armadillo. Benjamin Vincent has been illustrating Bluebonnet’s adventures for more than 20 years. Bluebonnet, whose home was in the nearby Hill Country of Texas, paid a long awaited visit to the Alamo. To her surprise she met another armadillo. His name was Digger Diller, and he lived in a burrow under the Alamo. In fact, his family had lived there since the great battle in 1836. Their prized possession was, you guessed it, Jim Bowie’s knife. Enjoy this fanciful excursion into Texas history as Digger Diller tells Bluebonnet about his great, great grandfather’s eye-witness account of William Travis, Jim Bowie and the early Texas heroes who stood against Santa Anna for Texas’ independence. Bluebonnet explores the Ocean Star Museum in Galveston, Texas. To discover facts about the off shore oil system, she secretly follows a school group touring the museum. She learns about life on the drilling rig, offshore history, and rig safety through the tour guide and knowledgeable pelican, Red. Bluebonnet learns that the museum itself was once a working offshore rig, where people lived and drilled for oil beneath the sea. Since its opening 1997, the museum has taught kids about many products made from petroleum and how drilling platforms now out of service have become reefs. Towards the end of the museum tour, Bluebonnet hops aboard a departing shrimp boat with Red to see some offshore drilling rigs in action. After all, Bluebonnet is always ready for a new adventure! The travelling Texas armadillo, Bluebonnet is on the road again! This time, her travels take her to Kilgore, Texas, the home of one of the largest oild fields in the world. As soon as she arrives, Bluebonnet meets her four nephews –Wildecatter, Bradford, Hunt, and Lloyd__who tell her about their oil-industry namesakes. 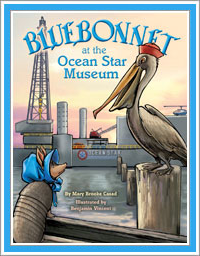 Bluebonnet is eager to learn more, and before she can say “Boomtown, U.S.A.”, her nephews whisk her away to the Wast Texas Oil Museum for another adventure in history. At the museum, the armadillos visit the towns of East Texas as they were in the 1930s, when oil was discovered. They venture below the surface of the earth to learn about how fossils created oil, witness oil gushers shooting high into the air, and feel the ground tremble beneath them as they experience first hand the excitement of the oil boom. Bluebonnet at the East Texas Oil Museum is a wonderful introduction to the East Texas Oil Museum and makes an ideal souvenir or travel companion for young visitors and anyone curious about East Texas and the oil industry. This third in the series takes Bluebonnet to Dallas for the annual fall festivities. She has a surprise visit to the Cotton Bowl during the Texas vs. Oklahoma football game. There she meets a rabbit named Joe Bob from east Texas. They discover that the State Fair can be scary if you get lost, but fun when you get to ride the roller coaster. Bluebonnet, everyone’s favorite Texas armadillo, is about to take a trip that will elevate the reputation of armadillos to new heights and altitudes! She’s blasting off on the space shuttle to become the first armadillo to attempt a space walk. She and her sister Normadillo are touring the Johnson Space Center in Houston when the scientists and astronauts ask her to help them out with their next space shuttle mission. Children will love the outlandish antics of the armadillo-turned-astrodillo as she suits up for the big flight. They will also learn about the space program, what it takes to become an astronaut, and the many exhibits and special events at the Johnson Space Center. Colorful and action-packed, the latest book in the Bluebonnet series introduces young readers to the high-tech world of space travel from the delightful point-of-view of Bluebonnet, the space-traveling armadillo. With curiosity as her guide, Bluebonnet, the most travelled armadillo in Texas, leaves her home in the Hill Country for a visit to Dinosaur Valley State Park. At the park, Bluebonnet’s adventure begins when she decides to explore what looks like a burrow in the ground. Inside the burrow, much to Bluebonnet’s surprise, she discovers Spike the glyptodon, a prehistoric relative of the armadillo. Spike has been asleep for many years and is sad when Bluebonnet informs him that all of the dinosaurs are gone and that only their tracks remain in Dinosaur Valley State Park. As the two explore the park together, they are unaware of the fact that Spike is leaving fresh dinosaur tracks, and that the tracks have been discovered by people! Can Bluebonnet keep the visitors from finding Spike, the last known living dinosaur? With colorful illustrations and a popular little hero, author Mary Brooke Casad teaches children about armadillos and their ancestors, mixed with a dash of Texas history. “Texas, our Texas, all hail the mighty state!” sings Bluebonnet, the armadillo, as she begins the Texas State Song on the grounds of the state capitol in Austin. She soon meets Mac, a mockingbird, which happens to be the state bird of Texas. Mac offers to give Bluebonnet the tour of the capitol. They sneak inside, and Mac shows Bluebonnet statues of Sam Houston and Stephen F. Austin. As they contine their tour, they see a group of schoolchildren, including two that are dressed up as a Longhorn and an armadillo! Why would they be dressed up like that? That’s exactly what Mac and Bluebonnet want to know, so they follow the sudents and find out that the children are meeting with the governor to try to decide on the official State mammal. Some children want the armadillo and others want the Longhorn. Which one will it be? Soon, in an outdoor arena, they meed Mac’s friend Bevo, a Longhorn. He wants to find out what the State mammal is going to be, too. At first, Bluebonnet and Bevo don’t know what to make of each other. They are both being considered by the schoolchildren of Texas for the State mammal. The rivalry quickly dissolves, though, in the true spirit of the State motto, “Friendship”. Together, they find out. Which one will it be? Which would you vote for? Longhorn or armadillo?